President Donald Trump has given the family’s global inventory of golf courses a new level of international attention. WASHINGTON — It is a golden age for golf — at least as far as the Trump Organization is concerned. On Memorial Day weekend, the Senior PGA Championship will be held at the Trump National Golf Club in suburban Washington, D.C. In July, the company’s course in Bedminster, New Jersey, is hosting another major event, the U.S. Women’s Open. The company is also bidding to host the Scottish Open or a half-dozen other possible professional tournaments at courses it owns in spots around the world from Miami to Dubai. What he did not mention at the news conference, while the cameras were rolling, is the product placement of incalculable value that is helping boost the Trump Organization’s golf courses: his father. President Donald Trump has given the family’s global inventory of golf courses — 15 that it owns, one that it manages in Dubai and three others under construction — a new level of international attention. He has returned to his home at Mar-a-Lago resort in Palm Beach, Florida, for four out of the past five weekends in office to play golf at two of his nearby courses, including rounds with the prime minister of Japan. Before he was sworn in, Trump spent days interviewing potential Cabinet members at his Bedminster course. In total, Trump has played golf at least seven times since he was inaugurated — each time at his family’s own courses. Trump is certainly not the first golfer in the White House — 16 of the past 19 presidents have been golfers, including Barack Obama, who played 333 rounds of golf, according to a count by Mark Knoller, a CBS News reporter who maintains such data. But Obama’s most frequent golf venue was Joint Base Andrews, not a collection of golf courses he owns, where membership initiation fees hit as high as $250,000. It is “synergy” to be sure, for the Trump family and its golf enterprise. Eric Trump says the company has invested more than $1 billion in the golf-course business since 2005 and has seen a recent surge in revenue because of the continued rising fortunes on Wall Street, which is always good for this high-end game, as well as the unprecedented attention that the brand is receiving. But to some, it sounds like a serious conflict of interest. Trump owns the resorts, and critics say he should not be using the Oval Office as a global advertising platform for his businesses. While Golf Digest has called the president “Golfer in Chief,” these critics say he may be more appropriately called “Marketer in Chief” for Trump golf properties. Eric Trump defended the overlap, saying it was nothing unusual. “Bush arguably brought name recognition to Crawford, Texas,” Eric Trump said Thursday, noting that George W. Bush had a ranch there that he frequented. But when pressed — Bush derived no commercial benefit from his ties to Crawford — Eric Trump then offered a different defense. “The American people elected a businessman,” he said, adding that to his father the golf courses are “his home” and the fact that they are for-profit enterprises is secondary. But the overlap is drawing protests, including from environmental groups, which are angry that one of the first acts Trump took as president was to move to repeal a landmark Environmental Protection Agency rule — hated by the golfing industry — that is intended to protect drinking-water supplies. “A devastating economic impact on the golf-course industry,” the Golf Course Superintendents Association of America argued, as it urged members to help push to kill the rule. Even women’s rights and immigrant rights groups are rallying, including one called Wall of Us, which is calling on the Ladies Professional Golf Association to move its U.S. Open tournament scheduled for July at the Trump family course in New Jersey, given the president’s past comments that many considered insulting to women. For Trump, who ridiculed Obama for playing too much golf when he was in office, the sport is more than a pastime; it is potentially good for his business. And he has been noisily and passionately promoting his golf properties in every corner of the typically staid golf community for more than a decade. In 2022, Bedminster is scheduled to host one of golf’s most prestigious men’s major championships, and he has forcefully — and so far unsuccessfully — lobbied the sport’s foremost national governing body, the U.S. Golf Association, to award its most prized tournament, the U.S. Open, to a Trump golf course. 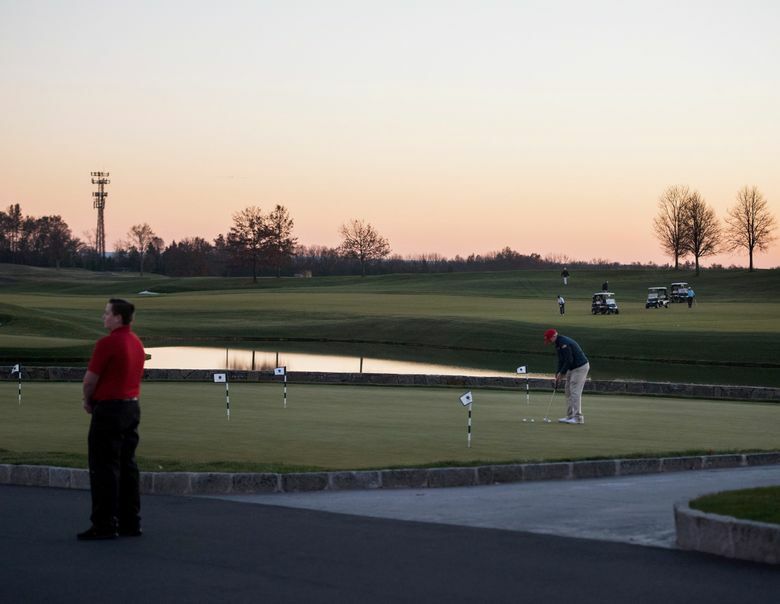 Although Trump has said the company’s golf resorts have been a roaring financial success, running golf courses is not easy, and an economic downturn or even a rainy summer can hurt the bottom line. It is impossible to know how much money Trump’s courses actually make. The Trump Organization is privately held and it has not released any detailed financial information on them. Trump has not released his tax returns, which would also shed light on the courses’ profitability. What little information has been released does not paint a full picture. Take Trump’s resort in Doral, Florida, which he bought in 2011 with financing from Deutsche Bank. On the financial-disclosure forms he was required to file as part of his bid for the presidency, he said that course had revenues of more than $50 million in 2014. The course’s profits were not listed, but Trump’s lawyers disclosed in a 2016 court case that after paying operating costs, the resort had actually lost $2.4 million that year.